Regularly looking for where to buy paper? Then search no further than the Post Office Shop! Should you be looking for paper in a particular size, we have A2 Paper, A3 Paper, A4 Paper and A5 Paper all available for Free Next Working Day Delivery at the most competitive of prices. If you need to purchase paper in a specific weight, then we have 75gsm Paper, 80gsm Paper, 90gsm Paper, 100gsm Paper, 120gsm Paper, 160gsm Paper, 190gsm Paper, 200gsm Paper, 250gsm Paper, 255gsm Paper, 260gsm Paper and 300gsm Paper to suit your needs. No matter the type of work you’re carrying out, we have a great array of Paper by Type available including Printer and Copier Paper, Coloured Paper and Card, Large Format Paper, Photo Paper, Carbonless Paper, Fax and Till Rolls, Speciality Papers and Plotter Paper so you can trust the Post Office Shop to provide you with the best Paper supplies at the best prices! See all itemsOur extensive selection of A2 Paper is available in a variety of thickness. See all itemsOur extensive selection of A3 Paper is available in a variety of thickness. See all itemsOur wide range of A4 Paper is available in a selection of different thickness. See all itemsView our selection of A5 Paper provided in a wide assortment of thickness. See all itemsOur 75gsm Paper is perfect for your regular printing and copying needs. See all itemsFor regular print outs in the office or home, use our range of 80gsm Paper. See all itemsAdd a premium finish to documents with our range of 100gsm Paper. See all itemsOur 120gsm Paper is ideal for producing posters and photographs. See all itemsUse our 160gsm Paper for premium print outs that require more durability. See all itemsChoose 190gsm Paper for creating hard wearing and tougher photo prints. See all items200gsm Paper provides the perfect weight for creating high quality images. See all itemsOur 250gsm Paper gives you the ideal quality of print when framing photos. 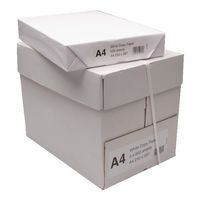 See all itemsSelect our 255gsm Paper for high quality paper when archiving photographs. See all itemsOur range of 260gsm Paper is ideal for creating detailed signs or posters. See all itemsUse 300gsm Paper when producing heavier weighted print designs. See all itemsOur selection of Carbonless Paper is perfect for multi-part forms and more. See all itemsCreate templates and print out important projects with our Plotter Paper.